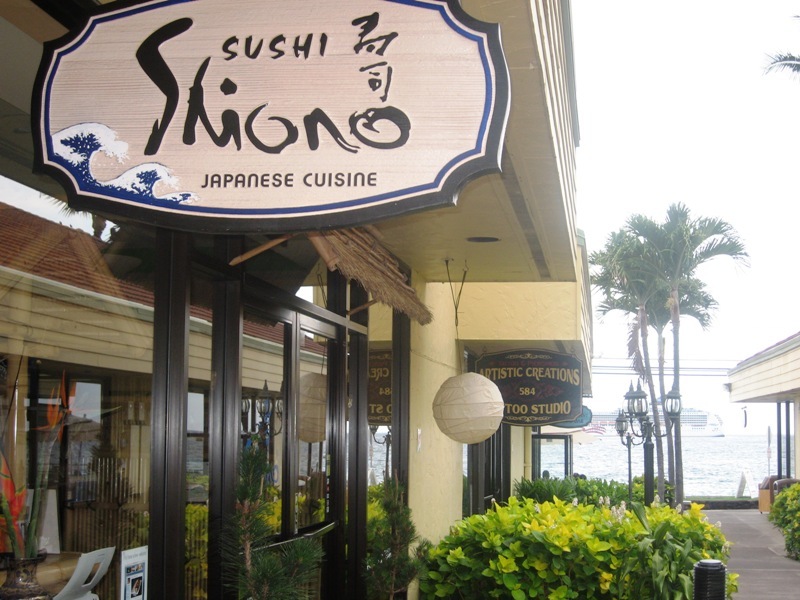 Shiono’s is located in the Alii Sunset Plaza, a bustling mini-mall full of interesting shops, dining opportunities and personal services. At the restaurant’s front door, peer “makai” down through the shopping alley for a framed view featuring the weekly cruise ship moored in Kailua bay. Entering the hushed tea house atmosphere from the busy mall outside, I felt as if I should remove my slippers, press my hands together in praise, and bow my head as the smiling hostess eagerly escorted us to our table. 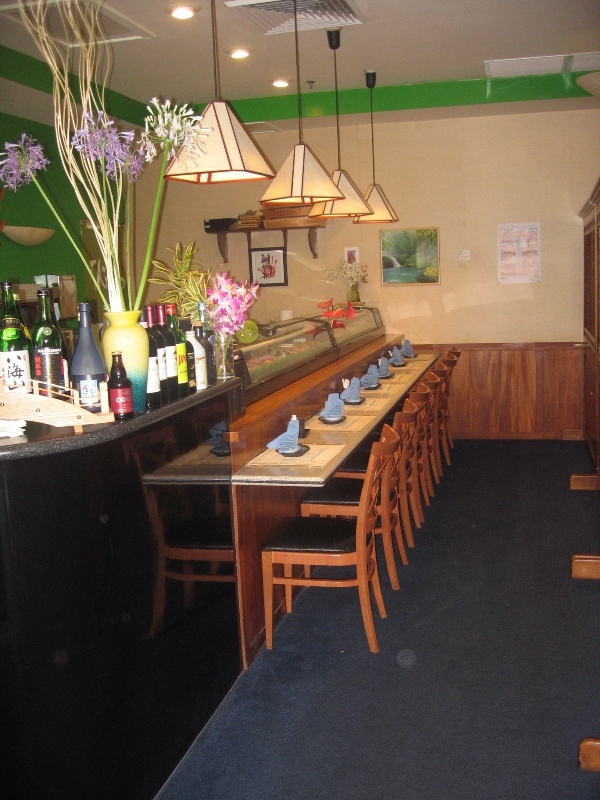 The small restaurant features a sushi bar separated from the table seating by a wooden screen. 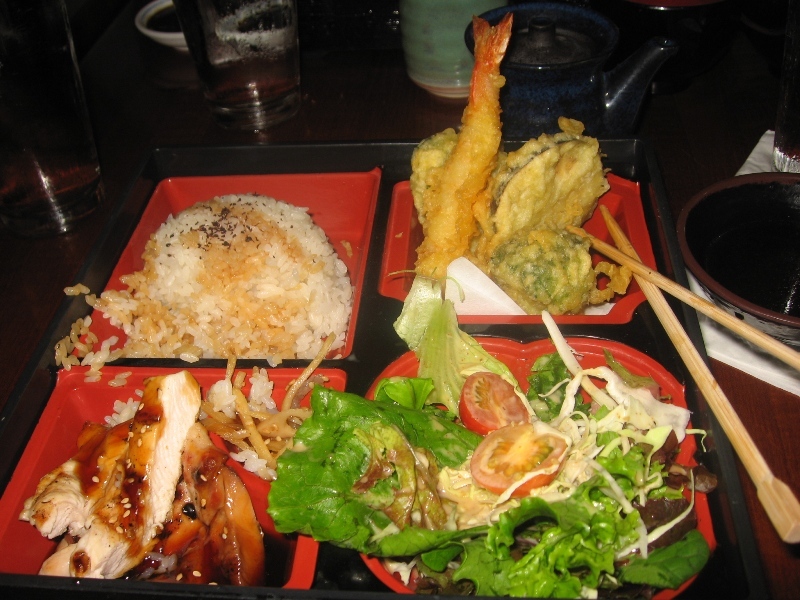 Tina enjoyed her savory teri chicken and tempura lunch for $9.50 – noting that Shiono has the “best tempura in town”. We all had hot tea with lunch so we didn’t imbibe from their beer or saké collection. The Kona Babes always split our lunch tab evenly between us, and today resulted in a cost of $13 each, including tax and tip. 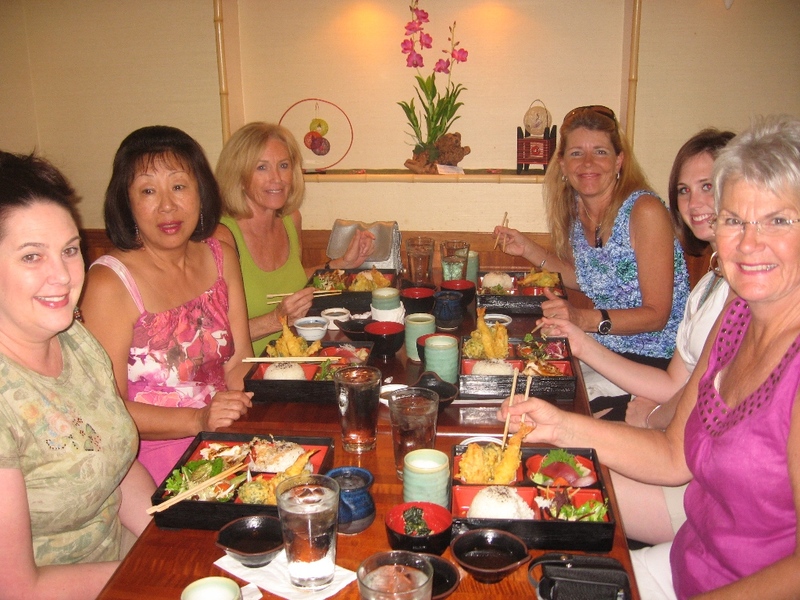 As Joann mentioned, “Shiono’s offers a great lunch at reasonable cost” – and I wholeheartedly agree – don’t you? Afterwards, we strolled around the mall; perused the art gallery and headed into the Sandal Stop, which moved here from the King Kamehameha’s Kona Beach Hotel. From Keauhou – Go north on Alii Dr. Pass the beach volleyball court (on right) and make a right turn into the driveway, park in the lot behind the mall. A fortuitous batch of errands placed me downtown and close enough to indulge in lunch at Shiono’s today with babe-in-training, daughter Heidi, (and friend Scott) before they head out to Boston tonight. At noon, you could have rolled a bowling ball through Alii Sunset Plaza and never found the gutter – likewise, we had no problem finding a table in the hushed oasis. 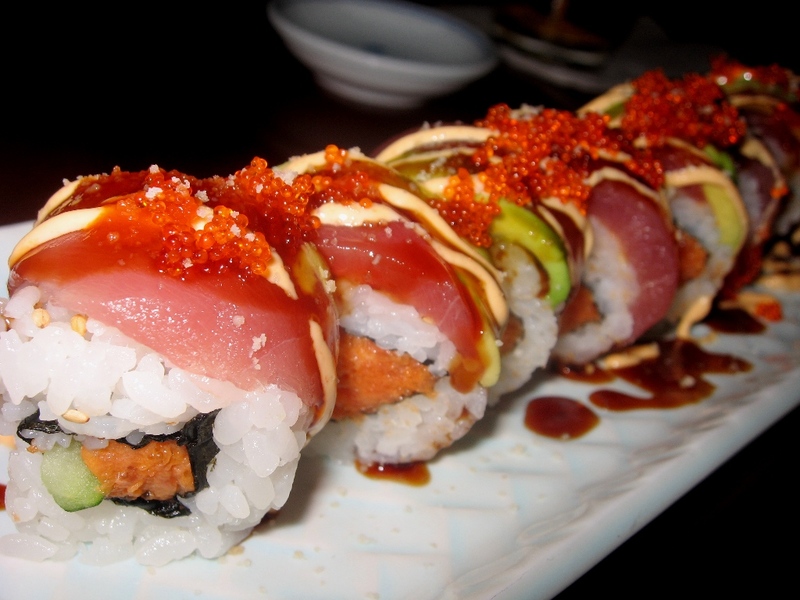 Starting with the Hawaiian Volcano Roll (ultimate designer sushi at $15), constructed out of spicy tuna wrapped with ahi, avocado; drizzled with a spicy-sweet reduction braided together with a creamy sesame sauce and garnished with tobiko (flying fish roe) that popped in da’ mouth! This hugh platter could have easily sufficed for lunch accompanied by bowls of steamy miso soup – but we persevered and continued on with entrees. 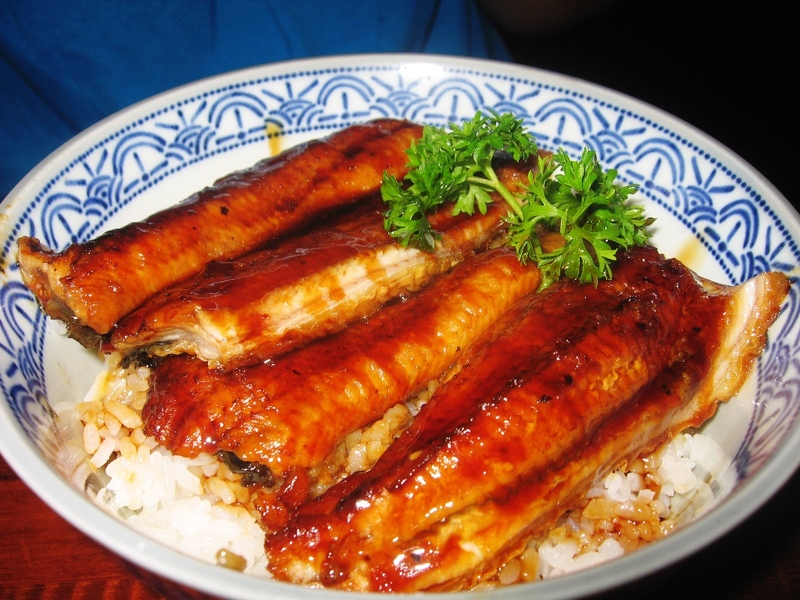 Heidi ordered a bowl of Unagi Don – freshwater eel served on rice – the Japanese answer to Loco Moco. This concoction was $12, and included miso soup. 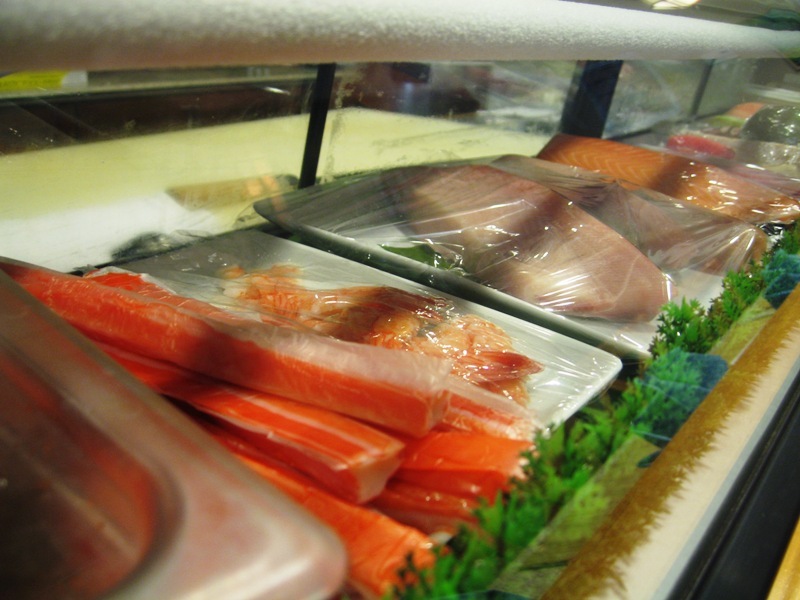 She thought the eel was quite “fatty” – but never tasting eel myself, I could not know what a fatty eel would taste like. Do they serve skinny eels? Do eels suffer from anorexia and/or obesity? Does the texture change as the weight increases or decreases for eels? Life’s many unanswered questions. I can tell you that I would never stick my hand in an eel’s habitat to ask! 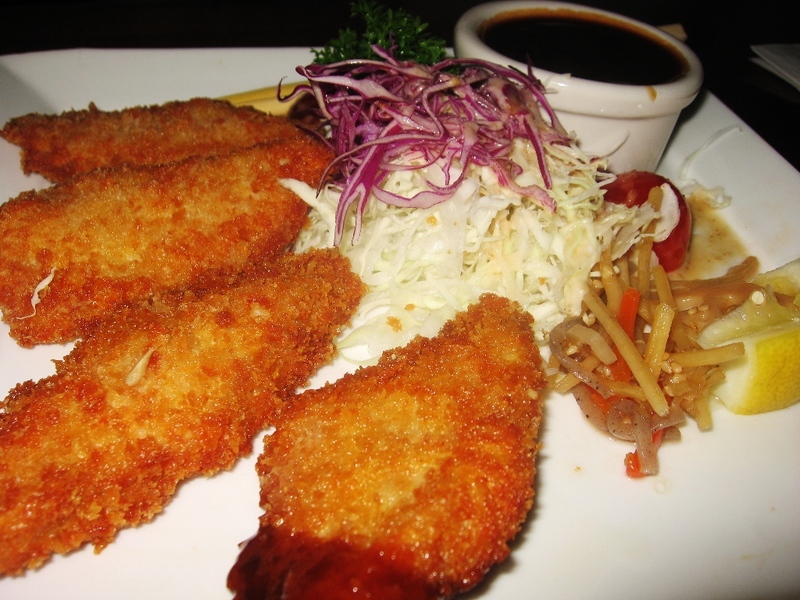 Tempted by a neighboring customer’s lunch, Scott settled for the Ahi Katsu ($9.50), a straightforward dish featuring four pieces of deep fried ahi, dipping sauce and the customary shredded cabbage/daikon mixture. He found it to be tasty, but a bit overdone. Fortunately, he feasted earlier on the sampler plate of tempura and sushi. 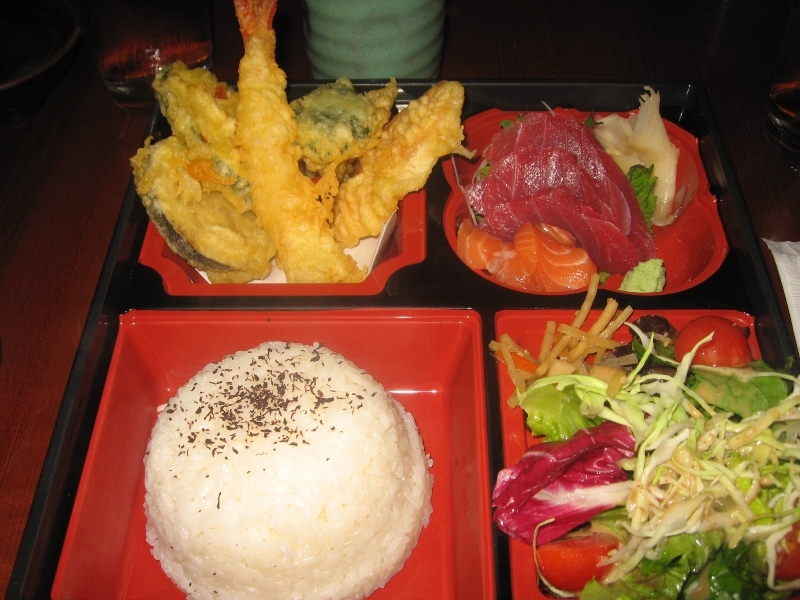 I must be getting older and boring since my lunch choice was the same-o, same-o as my last visit with the Babes: Sashimi & Tempura bento. The quality was the same as before – excellente! 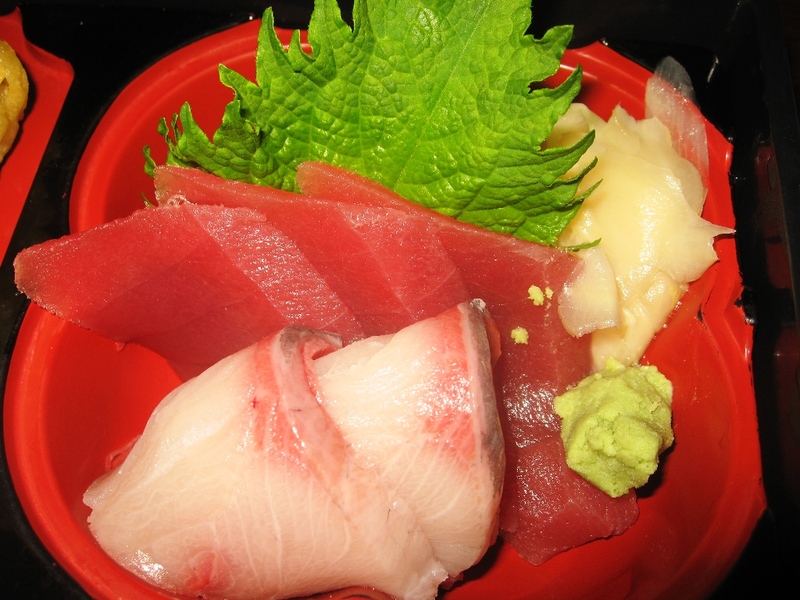 The raw fish offering du jour: pink ahi and thick slices of right-out-of-the ocean yellowtail. The tempura remained crispy without becoming greasy – and I am thankful that it did not suffer the same overfried fate as the ahi katsu. Miso soup! as a young girl with a calabash Japanese uncle who spent Saturday mornings at Moilili Store, browsing large glass apothecary jars filled with fresh miso paste. In those days, miso was carefully weighed on one of those old pharmacy scales and packaged in small clear bags, deftly tied in a closure knot with a rubber band. My uncle would return those bags, cleaned, after he used the miso in various dishes. I learned to eat all things miso, and chopsticks were a more natural utensil to my young brain than forks, spoons and knives. 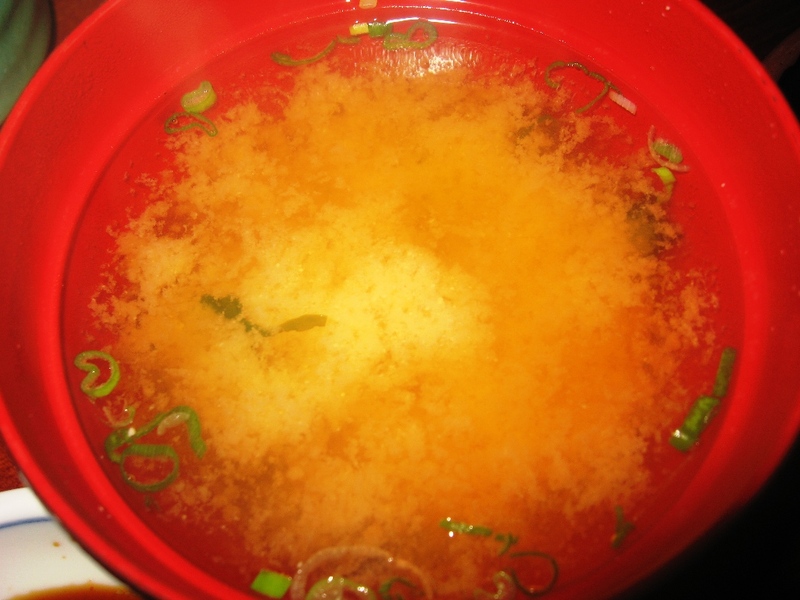 Shiono’s Miso soup is delicious with tender squares of silky tofu peeking out from beneath the cloudburst of miso, which floats in the dashi every so gently. Try it – you just may be able to solve the world’s problems after a bowl full!